Oxfordshire-based Nolan Oils has expanded with the addition of Sodbury Fuels, a brand new distributorship set up 70 miles away from its own base. Based in Chipping Sodbury near Bristol, the business is headed up by former driver ADR-CPC trainer, Andy Welch. Andy has worked in the oil industry for 17 years; born and bred in Chipping Sodbury, he is very familiar with the area and its people. "When we looked at the potential in Sodbury, we both felt excited," said Andy. "We only launched this month and trade is already very encouraging. I’m delighted to be working directly in the industry again. " "This new operation enables us to service some prime heating oil territory," said managing director Mark Nolan. "Between our two depots we can serve a big swathe of Oxfordshire, Wiltshire, Gloucestershire and north Somerset, as well as other areas surrounding our two bases." “We’re looking forward to realising the business potential of this new venture. A well-liked person capable of building a business, Andy has matchless local connections." Mark started Nolan Oils in the 1980s with just one tanker and handful of customers. The company now employs 15 staff, runs a fleet of six tankers and has an annual throughput of 20 million litres of product. 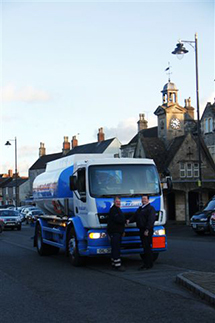 Sodbury Fuels will sell a full range of oil/gas products as well as oil storage tanks.